Dana Wessel works at Go963 FM in Minneapolis and formerly worked at Enterprise Rent-A-Car under their excellent corporate structure where *they* gave *him* the tools to be his own boss. 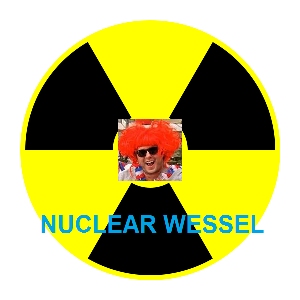 Welcome to another edition of Nuclear Wessel! Before we get to the matches, I want to share a life-altering soccer-related experience that happened last week. I got to meet Landon Donovan. Now, this is going to come off as super-braggy and I apologize, but enough people have asked and it is a cool story so I'd like to share. The Minnesota United was having its press conference to announce their MLS mid last Wednesday morning. It was held at Target Field which is across the street which is across the street from the station so I got there a little early. I see my pal Nick Rodgers, president of the United, talking to some other people in suits so I walk up to say hello without realizing one of the people he was with was the greatest American soccer player to ever live. You know that nervous feeling you got in your stomach when you were young and you were around a girl or guy you liked? It was like that feeling taken to a different level. I was honestly in shock. Nobody had any he would be there. Imagine walking up to your friend and he is talking to your hero. It is surreal. When the time was right, Nick introduced us and I stammered some rambling thank you for all he had done for US Soccer while praying he didn't think it was weird how sweaty my palms were during the handshake. Nick asked if I would take a picture of the two of them for social media to announce the surprise guest. I managed to keep my hand from shaking enough to take it. Nick then took a picture of the two of us and by doing so immediately became the best man at my wedding and the godfather of my children. I then chatted with Donovan for a while. Just the two of us at first before others joined the conversation. At one point Landon announced he was going to get a water and asked if I wanted one. Landon Donovan offered to get me a water! What! I of course said yes. There is that old saying about never meeting your heroes. And it is true in a lot of situations, but not this one. Landon couldn't have been a nicer, cooler guy, more genuine guy. Something I’ll never forget. Now, does anybody know where you can get a picture printed on a pillow case? Asking for a guy who has a sweet picture of himself with Landon Donovan. OK. Enough chit chat! Onto the matches! The Premier League scheduling gods did us some favors this weekend. The weekend is front-loaded. All three of the biggest matches are in one nice, convenient, meaty triple-header on Saturday. That frees up people to go hang with their families on Easter Sunday if that is your thing. Seriously, don't even try to talk yourself into Sunderland/Newcastle. Go see your folks, ya jackals. Last year: Arsenal got the full three points against Liverpool at home. It was November, still early in the season before Liverpool went on that run and scared the crap out of all non-Liverpool fans by almost winning the league. You know the old sports cliche of a Cinderella ending? What is the opposite of that? A Reservoir Dogs ending? Because that is what Steven Gerrard is having at Liverpool. His slip last year and red card last week is just a horrific way for a club legend like him to go out. There is no chance he appears in any meaningful minutes again for Liverpool this year, right? Except maybe a token appearance at Anfield after their top-four fate is sorted? That aforementioned red card from ol Stevie Me puts Liverpool in a real tough spot as far as qualifying for Champions League goes. They sit in fifth, five points behind United and six points behind Arsenal. With United playing home vs Aston Villa, a draw doesn't really even help matters much with only seven matches to go after this weekend. Liverpool are in 3-point territory. They run into the buzzsaw that is Arsenal right now. Other than getting shipped by Monaco in Champions League on away goals, the Gunners have been impressive. They have failed to win only one Premier League match since New Year's Day and find themselves in the semifinals of of their FA Cup defense. A win vs Liverpool would see them leapfrog City who don't play until Monday. I don't see how you can bet against the home side tomorrow. Everyone is healthy and happy at Arsenal for the first time in ages and Arsene Wenger's side shows no signs of slowing down. Meanwhile, Brendan Rodgers has spent his week denying the club is going to sell Raheem Sterling. Just like they weren't going to sell Luis Suarez. Or Fernando Torres. Enjoy him while you got him, Liverpool supporters. I like Arsenal to win but these things are tough to predict when a team is as desperate as Liverpool. Plus, they won't have their old captain in there to screw things up for them. I could also see a 1-1 or 2-2 draw. HEY SLUMBERLAND, HOW YOU LIKE MY COUCHES?! Last year: United beat Villa 4-1 last year at the Theater of Dreams. Juan Mata scored! Remember him?! Chicharito scored! Remember him?! Wayne Rooney also scored twice but he is still relevant and good at football so he doesn't get the sarcastic "remember him?!" treatment. United realistically had one goal heading into this season and it was to make their return to Champions League a swift one. After beating Liverpool last weekend they are firmly in the driver's seat of their Chevys but have some tricky fixtures left. This, however, is not one of them. If they do manage a way to soil their Champions League sheets, it won't be this weekend against a Aston Villa team that is once again *just* doing enough to keep out of the drop zone. They'll lay down and die easily to an in-form United team. Robin van Persie remains out but that really shouldn't matter. United still have matches against City and Arsenal and a match at Chelsea remaining. Plenty of bigger meats to hit the smoker. United roll comfortably. Something like 3-1 we'll call it. Last year: Chelsea had a 3-0 laugh against Stoke at the Bridge almost to the day last April. The match will always be significant for Chelsea fans because Frank Lampard scored his 211th and final goal in the Blue shirt of Chelsea. Nothing like blowing a 2-0 lead to Hull City and needing a soft winner to instill some confidence with eight matches to go, huh?! But like Burt Reynolds always says, three points is three points. In order to lift a league trophy you are going to have ugly wins. They come all throughout the season. Credit to Chelsea for getting all three. They have eight matches remaining including this match vs Stoke. Jose Mourinho has done the math for us. Chelsea are under the assumption that City will win out. That means they need 6 wins and a draw in their final eight matches to guarantee the trophy has royal blue ribbons on it come the final day of the season. That is, of course, assuming City win out, which will be no small task. They still have matches against at United and at Spurs and end the season at vs Southampton. Chelsea face a tricky one at home vs Stoke City who sit level on points with West Ham in ninth place. They had run off three straight league wins before losing two in a row to Crystal Palace and West Brom. The Blues haven't lost at home this season but have drawn their last three at Stamford Bridge in all competitions. Jose Mourinho said Friday that Diego Costa remains a doubt with that nagging hamstring injury. Could be more Mourinho mind games or he could actually sit. You never know with him so it is pointless speculating. If he can't go, look for last week's hero Loic Remy to start up top. Every match from here on out carries the importance of a cup final for Chelsea. And don't think their opponents don’t know that. Six wins and a tie is all it will take. Come on you Blues. That'll do it, Nuclear Warheads. Until next week, keep your shinguards taped and your jerseys tucked in.